President Larry Roberts called the meeting to order at 6:33 p.m. Directors present for the meeting were Doug Alred, Jane Alred, Christy Astorga, Bonnie Brooks, Errol Daniels, Susan Haag (via phone), Angela Harris, Dennis Harrison, Stan Lambert, Franz Lerch, Todd O’Donnell, Ty Payne, Larry Roberts, Larry Sassa, Paul Smith, Lamar Strother, Douglas Tillett, Stuart Toomey and Jim Van Cleave. Special Guests in attendance included Mark Ryan and Nicole Andress. Approval of 9/4/18 (September meeting) minutes: On a motion by Lamar Strother and seconded by Stuart Toomey, the September board meeting minutes were approved as submitted. Treasurer’s Report: Bonnie Brooks distributed copies of the Balance Sheet and the Profit and Loss Detail Statement through September 2018. Lines items discussed and paid included Bolles 1st Qtr Training sessions, Jacksonville University Graduate Assistantship Fall Semester payment, and Newsletter expenses. Income was derived from memberships and the half marathon training class. Taxes currently with Smoak Davis and hope to be completed by next month. Emerald Trail Plan Update – Larry Roberts reported that they are in the process of preparing legislation for the city council to sign off on as it pertains to moving forward with the Emerald Trail implementation schedule. Also, there will be an upcoming meet and greet event on the 16th with Ryan Gravel, the founder of the Atlanta Beltline, at Hyperion Brewery. Cross Country Trail Markers in city parks – From the discussion and trail walk through recon meeting with Colin Moore of Jacksonville City and Parks, which took place on Wednesday, September 5th, Larry stated that there was a 5-mile trail at Cedar Point/Park that would work ideal for the markers. We would need to develop marker rules which we would need to specify what to display. Where to Run in Jacksonville on JTCRunning.com – Paul Smith is leading the ad-hoc committee to see this project through. Current members to assist with this project include Doug Tillett and Larry Roberts. Paul mentioned that as they begin the process it would a good idea to view various sites to gain insight on what to do and what not to do in order to successfully create this tool. Ideas and suggestions from the group included the ability for it to be an interactive tool or database that people would be able to make comments. Map My Run was mentioned as a tool that could be used as a good example and starting point. 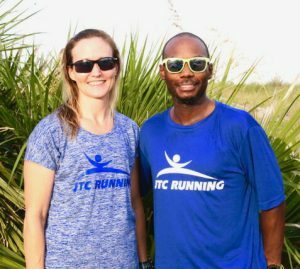 Again, the goal is to develop the tool/database of where to run in Jacksonville and to include in-depth details of group runs, routes, and races in Jacksonville that people can use whether they live in Jacksonville or are in town visiting. Fall Half Marathon Training Class Kickoff – Our fall half marathon training class kickoff was held, Wednesday, September 5th, at the 1st Place Sports San Marco store. Larry reported that we had 91 entries for the class and 40% were new members. Currently registration is available for the Gate River Run Training Class, which we already have 1 person signed up for the class. Nicole Andress for Board of Directors and 2019 Board returnees – On a recommendation from the Executive Committee, Errol Daniels presented a motion to elect Nicole Andress to the open board member position which was seconded by Bonnie Brooks and passed by the board. Board of Directors with expiring terms will need to inform the board of their intentions for 2019. These members include Bonnie Brooks, Errol Daniels, Susan Haag, Franz Lerch, Todd O’Donnell, Ty Payne, Lamar Strother, Douglas Tillett, and Stuart Toomey. Freed to Run Relay Race – Dennis Harrison spoke about the upcoming Freed to Run Relay Race is a court house to court house 26.2 relay race. The event involves 6 marathons in 6 days, 10-person relay teams, and races that start and finish at the court houses, which the finish line will be at the Duval County Courthouse. The race dates are 12/2/18 – 12/7/18. The event last year had good exposure and included an article in the Times Union. Dennis suggested we get involved by either fielding a team or contributing. The goal of each team is to raise $10,000, which will be matched by Baptist by up to 125%. Currently the medical and legal communities are involved. The board said that we would sponsor the finish line area by bringing the JTC arc and would also support by donating to the event once Dennis submits the donation request. Bolles Wednesday Morning Workout Coaching – Paul Smith reported on the issues and concerns regarding the morning workouts at Bolles. Paul stated that things have been going well but did mention that some participants have mentioned that they voiced concerns regarding the coaching styles, flexibility, and timing of the morning workouts. One of the main issues stated, that due to the lax start time and structure of workouts, several individuals had been late to work. Paul said that he wanted to inform the board of this and would look into this matter more. Sulzbacher Dinner – Our next JTC Sulzbacher Dinner Night is November 3rd. Registration is open on the website, which is slotted for 15 volunteers, however currently we only have 3 signed up for the event. Tijuana Flats Summer Beach Run and Kickoff – Doug Alred handed out the final financial report from the Summer Beach Run with the line items listed for total expenses. Again, he reiterated it was a well-attended event and we had to make some minor adjustments due to a few refunds issued due to the change of date and being on the same day as a Jaguars game. A motion was presented by Bonnie to even up to $9,000 our donation to the Just In Queso Foundation from the race proceeds and the motion was passed by the board. The check presentation to The Just In Queso Foundation will be on Friday, October 5th, at 3pm at the Lakewood Tijuana Flats. Guana Trail Races (Sun 12/2/18) – Mark Ryan reported that registration is currently open, shirts have been ordered, and we will be using race medals from last year. Mark will serve as the race director for the 50K, while Franz Lerch will serve as the race director for the 12K race. Last Gasp (Sat 12/29/18) – Registration is currently open and available on the website. Currently there are 14 signups. Winter Beach Run (Sat 1/19/19) – Doug Alred reported that registration is currently open as plans and arrangements are set with the City of Jacksonville Beach. Race date is January 19, 2019 with a start time of 2pm. Gate River Run (Sat 3/9/19) – Doug Alred stated that registration is open and available online as well as the “early bird” discount code would be active until October 10th.There will be some small adjustments this year to accommodate the city, the fairgrounds, and other pending items. After 10 years, McCall’s will not be back as a sponsor. Gate River Run Publicity/Sponsorship Committee – This newly formed committee will meet next Wednesday, October 10th, at Blue Pacific Taco to discuss ideas and plans to address proactively working with the City of Jacksonville and explore sponsorship opportunities. Committee members to include Doug Alred, Larry Roberts, Larry Sassa, Jane Alred, and Todd O’Donnell at this time. Classes & Clinics – Jane reported that the holiday social will be held at the 1st Place Sports San Marco store after The Festival of Lights race on 12/8/18. She will contact the caterers about the menu and finger foods. Community & Public Relations – Larry Sassa discussed ideas for our community and sponsorship outreach. That our plan should start with the development a brochure, presentation, and/or video that tells our story, is creative, and includes a historical perspective of the club. This could serve as a club video that tells who we are and what we do. We can develop a long version and a short version to be used on our social media sites and our website. Finance – No Report. Just In Queso check presentation. Membership – Stuart Toomey reported that membership was currently at 1,237 active members. Merchandise LogoXpress – Updated products and merchandise are available through LogoXpress on JTCRunning.com. Currently only 3 items had been purchased, so we need to develop a strategy to sell more items. Currently the products have been advertised on our website and our social media outlets, as well as the recently released newsletter. Ideas suggested to consider included pink merchandise for breast cancer awareness, as well as having an email blast for merchandise only. Old merchandise can be sold at 1st Place Sports stores. Communications: Newsletter, Social Media – The email blast has been sent out and the newsletter went to the printer this past Friday. Vision & Planning – Doug reported that Tomahawk Park will most likely need new shell from the recent harsh weather. He also mentioned that we need to put it to use, like the Run/Kayak event 1st Place Sports recently held at Wicked Barley. NEXT MEETING – The next board meeting will be Tuesday, November 6, at 6:30 pm in the Mediterrania Restaurant. The October meeting was adjourned at 7:44 pm.